ALEXANDRIA, Va. - The Center for Competitive Politics' (CCP) legal team filed a motion for preliminary injunction late last night on behalf of a Colorado group, Coalition for Secular Government (CSG). CCP asks that a federal judge in Colorado enjoin Colorado Secretary of State Scott Gessler refrain from forcing CSG to register as an "issue committee" until their constitutional claims can be heard. Otherwise, CSG will be unable to speak until a potentially lengthy litigation has run its course. The case stems from the efforts of Colorado resident Diana Hsieh. 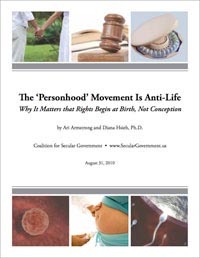 Hsieh, who holds a Ph.D. in philosophy, organized the non-profit CSG together with her friend Ari Armstrong in order to promote a secular understanding of individual rights, including freedom of conscience and the separation of church and state. Because of unconstitutionally vague state laws, confusion as to what constitutes political speech and what is covered under a press exemption, and a refusal by the state to abide by a federal court order, Hsieh and CSG have found it nearly impossible to carry out the activities of a small non-profit group without fear of running afoul of Colorado's complex campaign finance laws. "Given the strength of its case, we hope CSG will be allowed to speak unfettered until, and if, a court determines that they must register as an issue committee," he said. "It makes little sense to force them to register - and limit their speech accordingly - only to turn around many months later and tell them they had a constitutional right to speak freely all along." The Center for Competitive Politics promotes and defends the First Amendment's protection of political rights of speech, assembly, and petition. It is the only organization dedicated solely to protecting First Amendment political rights. I didn't like that 30% rule: it was poorly-constructed so as to disproportionately burden small groups. So I'm not sad to see that struck down, even though the result is that now we don't have any clear guidance on what counts as the "major purpose" that triggers filing obligations for issue committees like CSG. That's frustrating. I'm deeply unhappy that the rules capping fines have been struck down, as unlimited $50 per day per violation fines are downright obscene. What sane person is willing to wade through pages of confusing and complex campaign finance regulations and then attempt to file detailed reports on expenditures and contributions over $20 — with the threat of thousands upon thousands of dollars of fines for innocent errors looming over them?